Looks like I've been getting buttons all wrong this whole time. All my buttons consist of about one colour and have approximately zero tentacles. Also I've got them mostly on shirts. I never thought of gathering them up into a bouquet of buttons! 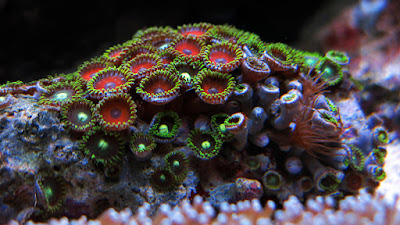 These new ideas are provided to us by the resplendent Button Zoanthids, a whole bunch of zoanthid species belonging to the genus Zoanthus. But what on Earth is a zoanthid? Aside from a colourful button with tentacles, that is. Zoanthids are the species that belong to the order Zoantharia, which in turn is part of the same group that contains far more famous relatives like jellyfish, corals and sea anemones. Corals and sea anemones both look rather flowery, but it's the zoanthids who got the Greek name for 'flower animal' (zoion - 'animal', anthos - 'flower'). Suits them! 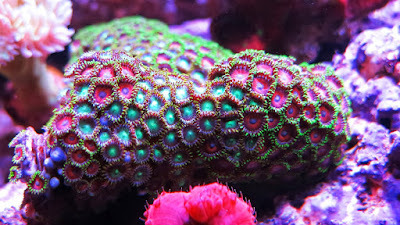 Zoanthids are not corals (even though they're sometimes called false corals or even soft corals) and they're not sea anemones (even though they're sometimes called colonial sea anemones). They're a whole other, separate thing on their own. 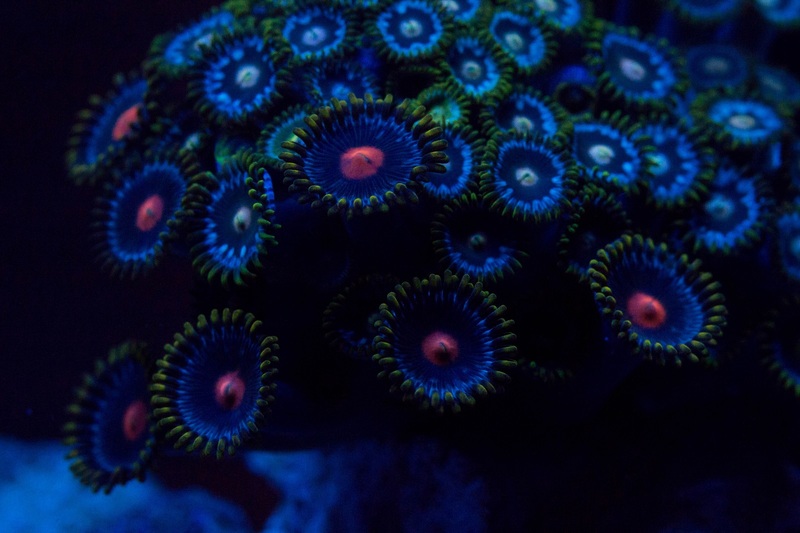 A thing called 'zoanthids'. See? 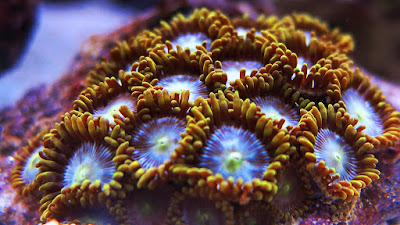 The Button variety are found in the Indo-Pacifc, all the way up to Japan, and the Caribbean, all the way up to Florida. 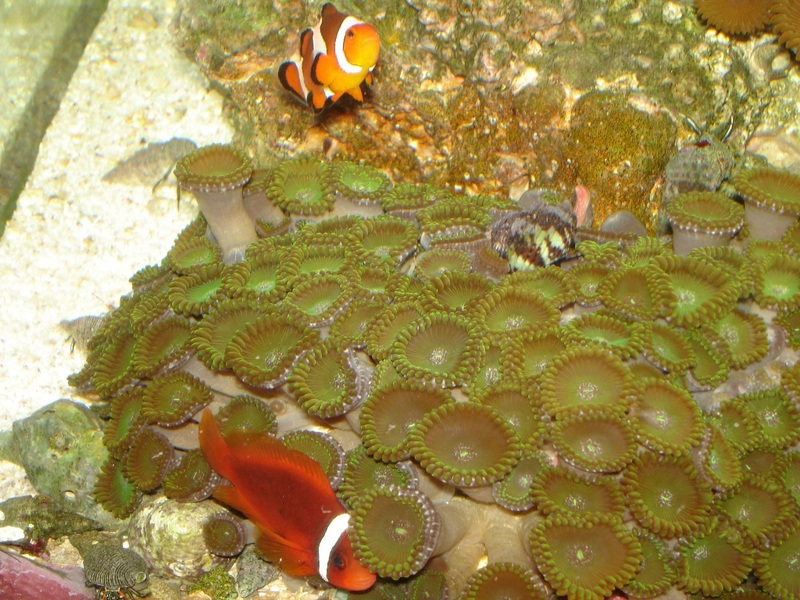 They consist of numerous polyps, each about 1 cm (0.4 in) across, and all embedded within a single, shared base to form a colony. The polyps are packed together so tightly it can be difficult to see past the tentacles to glimpse the body column that connects the flowery bit to the base. Good thing the tentacles are so nice to look at! Sometimes you can even get lots and lots of colonies - colonies of colonies - all growing together to carpet the sea floor. Like a lot of corals and sea anemones, zoanthids are packed full of tiny symbiotic creatures called zooxanthellae. These guys get all their food via photosynthesis and are kind enough to share it with their host. 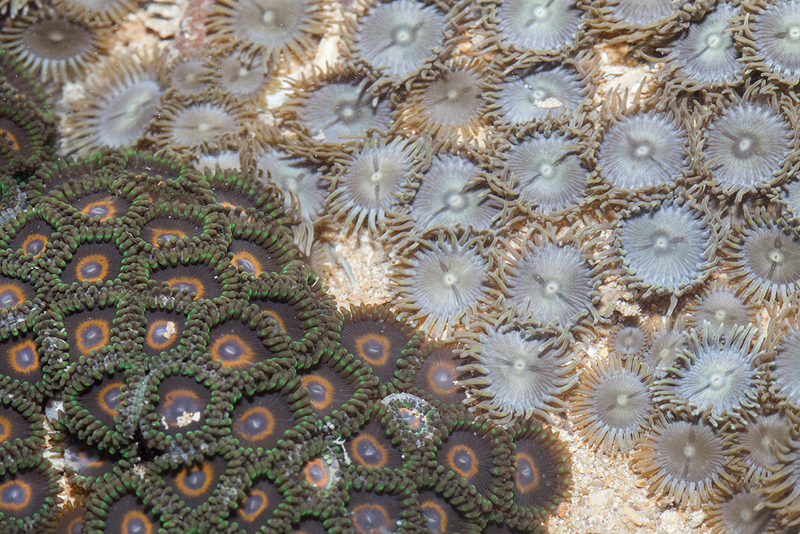 Some Button Zoanthids get all the food they need from these little friends of theirs. Others will happily nibble on any tiny crumbs of food that come their way. The one bad thing about those zooxanthelae is that they can lend Button Zoanthids a drab, greenish brown or brownish green colour. They can do that, but many of these 'flower animals' fight back heroically with striking dashes of bright, even fluorescent red, pink, blue or a host of other lovely colours. Phew! Looking at my own buttons, I think I've got a LOT of work to do. I am so disappointed in my dress shirts right now. You hear that, shirts? You're officially on probation! @TexWisGirl: Mermaids get all the best jewellery! @Lear's Fool: Ha! They have a lot to live up to!